Patrick is currently Senior Manager, Experience Design at TD where he is growing the awareness and adoption of Design Thinking tools and methodologies. He heads a small team of Service Designers that lead a variety of transformative projects and deliver coaching and skill building workshops for the entire organization. 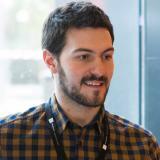 Previously, Patrick was at TELUS where he, over 2 years, helped build the Service Design practice and team. Patrick is also the founding member of the SDN Canada Chapter and hails from Montreal, QC.